What are the first and last lines spoken in the Star Wars movies? What are the first and last lines spoken in each of the Star Wars movies? Here's the first opening and last lines spoken in each of the eight Star Wars movies. Some of them have become classic quotes, especially Luke's to Han in Empire and Yoda's last line in Attack of the Clones. To finish the movie with the last line, Chewbacca yells a triumphant "grrrrrrrrr!" during the medal awarding ceremony. "Echo Three to Echo Seven. Han, old buddy, do you read me?" Skywalker also closes out Empire's last line when he cries " Ow!" as medical droid tests his new mechanical arm (replacing the arm Vader chopped off). "Command station, this is ST321, code clearance blue. We're starting our approach; deactivate the security shield"
This is quite clever as it makes references to clearance codes which become a plot point later on. "Oh. No, it's not like that at all. He's my brother." To which the Radiant VII captain: Yes, sir? Radiant VII captain: [to communication device] With all due respect, the ambassadors for the Supreme Chancellor wish to board immediately. Nute Gunray: Yes, of course. As you know, our blockade is perfectly legal and we'd be happy to receive the ambassadors. Boss Nass: gets to yell the last line "Peace!" to which Jar-Jar Binks responds with "Ya-hoo!" First line Naboo lieutenant: Senator, we're making our final approach into Coruscant. Last line of dialogue. Obi-Wan: I have to admit that without the clones, it would have not been a victory. Yoda: Victory? Victory you say? Master Obi-Wan, not victory. The shroud of the dark side has fallen. Begun the Clone War has. First line goes to R2-D2 who beeps something at Anakin to which he says: Lock on to him R2. R2-D2 responds with more bleeping! This conversation means that C3PO says the last line of the movie and then the first in the following, A New Hope which makes for some nice continuity. Notable for George Lucas not having his name on the script - JJ Abrams, Michael Ardnt and Lawrence Kasdan had a crack. First line - Lor San Tekka to Poe Dameron: "This will begin to make things right. I've traveled too far and seen too much to ignore the despair in the galaxy. Without the Jedi, there can be no balance in the Force." Perhaps that was a clever line to address some of the perceived missteps of the Prequel Trilogy? The last line of The Force Awakens aptly falls to General Organa as she speaks with Rey "May the force be with you!" Jyn notices the ship about to land and runs to her parents calling 'Mama!'. This means Leia has said the last line of three Star Wars movies! Want more? 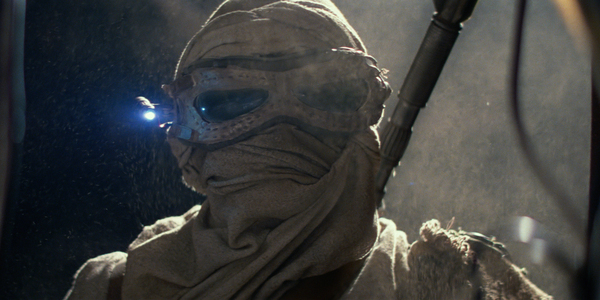 Check out the introduction text of every Star Wars title crawl and that of The Force Awakens. Resistance Evacuation Officer to Connix (played by Billie Fisher, Carrie's daughter) "We're not clear yet. There are still 30 pallets of cannon shells in C bunker." Connix: Forget the munitions, there's no time. Just get everyone on the transports. The last line again goes to Carrie Fisher's Leia when she answers Rey's question about rebuilding the Rebellion with "We have everything we need". The fifth Star Wars prequel told the tale of how Han met Chewbecca (and a bit more). The first line of the movie was: "C'mon, C'mon" as uttered by Han Solo as he steals a speeder. The last line spoken was: Han to Chewie "When have I ever steered you wrong?" If you liked this, check out the text of every film's opening crawl! Last line of TFA - MTFBWY! First Lines: [Male Rebel] "We're not clear yet. There's still thirty pallets of cannon shells in C Bunker." [Female Rebel] "Forget the munitions—there's no time. Just get everyone on the transports." --Several Star Destroyers jump into orbit-- "Oh, no." Last Lines (in English): [Rey (to Leia)] "How do we build a rebellion from this." [Leia] "We have everything we need."